Perhaps no topic is as difficult to categorize into the appropriate section of the ABIM Board, NBME Shelf, or USMLE Step exams as is hypertension. Is elevated blood pressure a topic for General Internal Medicine (we see it more than any other speciality)? Cardiology (where the patients with difficult-to-control hypertension go)? Or is it related to Nephrology (where most of the anti-hypertensive medications act)? Fortunately, agreeing on the perfect location in the syllabus is not for you to worry about. Nor do you need a deep understanding of each previous iteration of the somewhat fickle hypertension guidelines. When it comes to hypertension for the sake of the boards and the wards, all you need to do is master the latest recommendations regarding blood pressure management. 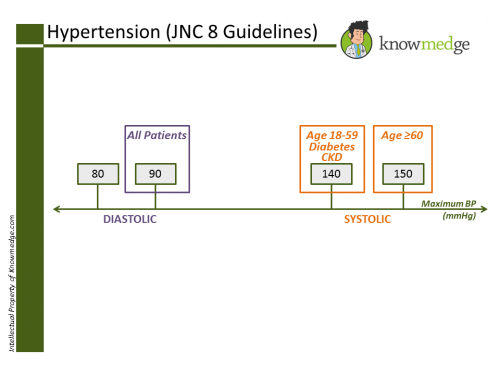 Despite their tardiness, the JNC 8 guidelines serve as the gold standard for determining the goal systolic and diastolic blood pressure levels in our patients, taking into account age and comorbid conditions. -Patients age 60 years or older who do not have diabetes or chronic kidney disease (CKD) should be targeted to have a goal blood pressure of less than 150mmHg systolic and less than 90mmHg diastolic. -Patients age 18 to 59 years have a goal of less than 140mmHg systolic and less than 90mmHg diastolic. 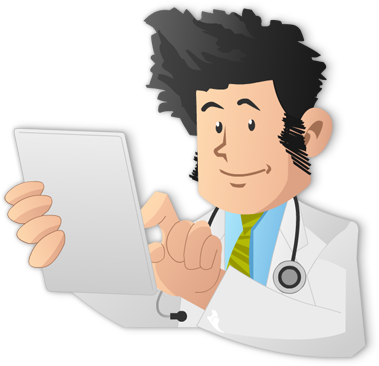 -Patients of any age with diabetes or CKD also have a goal of less than 140mmHg systolic and less than 90mmHg diastolic. One of the best changes of the JNC8 over JNC7 for board exam purposes is the simplification of the goal diastolic blood pressure. All patients, based on age or the presence of diabetes/CKD are managed to a goal of less than 90mmHg. With the exception of concurrent ACE inhibitors and ARBs, other combinations of the 4 agents can be administered to titrate to goal blood pressure. 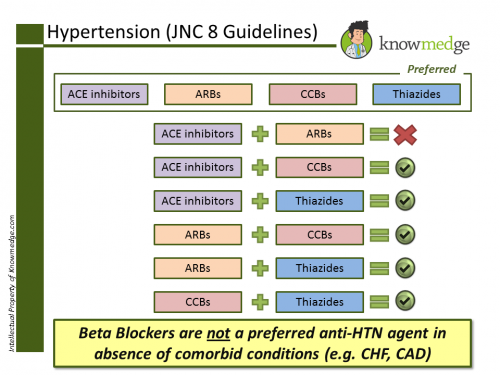 Note that missing from the above list are beta blockers, which are no longer considered top candidate medications for hypertensive patients in the absence of comorbidities (patients with prior myocardial infarction or congestive heart failure). 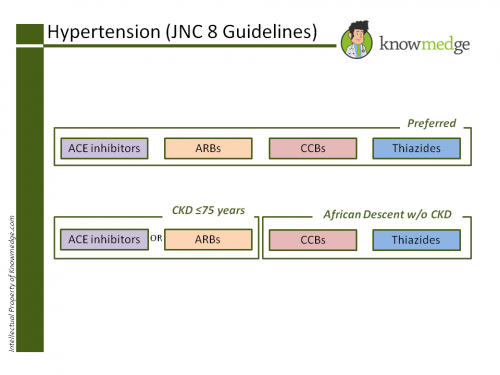 ACE inhibitors or ARBs are an essential part of hypertensive management in patients up to age 75 with CKD, regardless of ethnic background. Meanwhile, in patients greater than age 75 with CKD there isn’t evidence supporting renin-angiotensin system inhibitor treatment. While ACE inhibitors or ARBs can be used, CCBs and thiazide diuretics are also an option. Lastly, the ethnicity also plays a role in determining the preferred anti-hypertensive agent. When initiating blood pressure lowering medication in patients of African descent, ACE inhibitors should be avoided in favor of CCBs or thiazides. One of our Twitter followers asked when the December 2012 guidelines would appear on board exams, partly given their controversy. @knowmedge how long before you expect these updated guidelines to appear on board exams? My recommendation is that given the adoption of these guidelines by large medical organizations such as Kaiser Permanente, you should start to use the updates for both the boards and the wards. Drop a note below giving your take on the JNC 8 guidelines.